Scallop Mango Tartlets: Sweet Start to the New Year Scallops' refined taste and pearly whiteness make them a favorite holiday treat, writes food blogger Clotilde Dusoulier. And easy scallop mango tartlets are a perfect way to kick off the new year. I am not much of a New Year's Eve planner. Ever since my teenage days, I have observed this golden rule: Whatever you decide to do on that special night, your plans will end up changing entirely at the very last possible minute. Clotilde Dusoulier is the 26-year-old Parisienne behind the popular food blog Chocolate & Zucchini. She is working on her first cookbook. The parents who said you could use their apartment while they went to their own grownup celebration will decide to stick around instead. On another year, you and your friends will leave a little late (all right, very late) to drive to someone's country house, get stuck in traffic and reach the party long after midnight (but that's OK because you brought your own champagne). Or you will decide to host an intimate dinner and start cooking. In the afternoon, you'll get a call from a friend and invite him too -- along with a bunch of his own crowd, which turns your small gathering into a full-blown party, complete with loud music and irritated neighbors who won't call the police thanks to the New Year's Eve truce. Despite the change of plans, every one of these occasions is a happy memory. And every year I start all over again, planning my evening and my dinner, knowing full well that they will turn out to be quite different from what I expected, but no less joyous. Plans for this year are still up in the air, but if I have my way this time -- miracles happen all the time I'm told -- the menu will undoubtedly feature sea scallops. In full season during the winter months, their refined taste and pearly whiteness make them a favorite holiday treat. 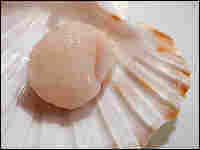 The sea scallop is a bivalve mollusk that lives inside a light pink, fan-shaped shell. The edible part (about 1 1/2 inches in diameter) is in fact the muscle that holds the two sides of the shell together. You can sometimes find scallops with their bright orange roe pouch still attached, and this part can be used to add color and flavor to a sauce for the scallops. Bay scallops belong to the same family: They are much smaller, about half an inch, but can be substituted for sea scallops (use three bay scallops in place of one sea scallop). On the U.S. market, bay scallops are scarcer and cost a little more than sea scallops, and they are usually more delicate in taste. Interestingly enough, it is the exact opposite on the French market, where the large variety, called coquille Saint-Jacques, is more prized than the smaller petoncle. Most fish shops in France sell sea scallops live and in the shell -- an unmistakable sign of freshness -- and will open and clean them for you at no additional charge. But I was once taught how to shuck them myself, and although the procedure is somewhat tricky and makes your fingers a little raw, it's all part of the fun -- and admittedly, a source of personal pride. If you buy them fresh, look for firm scallops with a dewy sheen and a sweet (not seaweed-y) smell. Store them in the refrigerator and use them within one or two days. Alternatively, you can purchase frozen ones from a trusted provider. 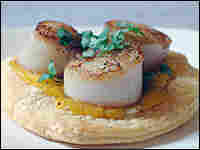 Home cooks are often intimidated by scallops and only eat them at restaurants. But they are actually very easy to prepare and are best enjoyed in simple dishes that fully reveal their flavors. The most important thing to know is that scallops should be seared very briefly -- they will still be slightly translucent inside -- to preserve their delicate taste and plump tenderness. Scallops go particularly well with fruits (citrus in particular) or slightly sweet vegetables such as leeks and gently cooked onions. They lend themselves very well to Asian inspired dishes too, and can be paired with soy sauce, ginger and sesame. The following recipe features sea scallops and thin slivers of mango on a golden round of puff pastry, sprinkled with a little cilantro. The subtle sweetness of these tartlets and their textural balance between smooth and crispy will make them an elegant first course for your New Year's Eve meal. You can serve them with a lightly dressed mache salad and a chilled bottle of crisp, dry white wine -- such as a French Chablis or a California Chardonnay. As a main course, I would suggest grilled filet mignon (or venison medallions if you can find them), accompanied by a carrot and chestnut gratin. A nice end to the meal might be a dark chocolate fondue, with plenty of fruits, cubed pound cake and marshmallows to dip into the luxurious melted velvet. May 2006 bring you health, happiness and excellent food! Preheat the oven to 400 degrees F and line a cookie sheet with parchment paper. On a floured surface, gently roll the sheet of puff pastry until it forms a 10-to-11-inch square. Use an upturned bowl, about 4 1/2 inches in diameter, and a knife to cut out four circles of dough. Place the circles on the prepared cookie sheet, prick them a few times in the center with a fork (to prevent excessive rising) and bake for 8-10 minutes, until puffy and golden. In the meantime, cut the mango vertically on either side of the pit, peel the skin and cut the flesh into thin slivers. Melt the butter in a large skillet over medium-high heat. When the butter turns a light nutty brown, add the scallops. Cook for one minute without moving them around, allowing a nice golden crust to form. Flip the scallops and cook for 40 seconds on the other side. (If you're using bay scallops, lower the cooking time to 30 seconds on one side, 20 seconds on the other). Transfer carefully onto a plate lined with paper towels. Remove the circles of dough from the oven, but leave the heat on. Drop specks of cheese on each circle (no need to spread it, it will melt in the oven), leaving a half-inch margin all around. Cover each circle with a fourth of the mango, and top with three sea scallops (or a fourth of your total). Season the tarts with salt and pepper and return to the oven for 2 minutes. Remove from the oven, sprinkle with cilantro, and serve immediately.